Gospel’s biggest nig ht did not disappoint as the 31st Annual Stellar Awards returned to the city of Las Vegas to celebrate Gospel music and the people who make it. 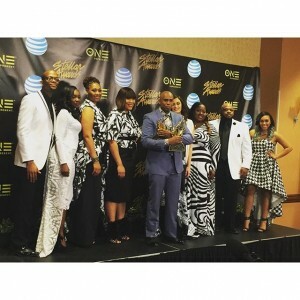 Anthony Brown and group therAPy made Stellar Award history as the Tyscot recording artists took home statues in the 10 categories they were nominated in. Other multiple winners included Charles Jenkins and Fellowship Chicago, the Rance Allen Group, Tasha Cobbs and Tina Campbell. One of the most memorable moments was the James Cleveland Award tribute to the late Olanda Draper featuring a reunion of his beloved choir the Associates coupled with fellow Brat Pack members Ricky Dillard, Donald Lawrence and Hezekiah Walker. The 2 hour telecast will make its debut on Sunday, March 6 on TV One and then begin its syndicated run in 125 markets between March 12 and April 10th. . A full list of the winners is found below. This entry was posted on Monday, February 22nd, 2016 at 8:44 am	and is filed under Artist News and Updates, Awards, Stellar Awards. You can follow any responses to this entry through the RSS 2.0 feed. Both comments and pings are currently closed.